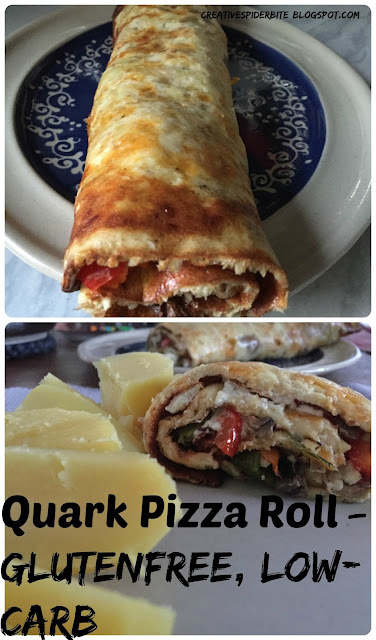 You might remember last weeks post about how to make your own Quark Cheese. 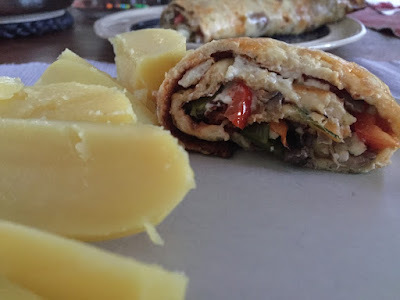 I was asked by some if I could also post some savoury recipes using it. So here comes a rather unusual one, that we have tried, tested and loved: A Pizza Roll! The Twist, its dough is made without flour, which makes it gluten free and also interesting for those that try to eat low-carb. If you wonder about the spuds in the picture, we ate the roll rather because we love the taste and not because we follow dietary guidelines, sorry guys! Add some fresh grated nutmeg, ground black pepper and a little spicy paprika. It should be solid when you take it out but not rock hard, now add what ever you would on your favourite Pizza. Ours had very little tomato sauce( with Italian herbs, onions, and a dash of cream) red peppers, spinach, mushrooms, tomatoes and feta. Then put it back in the oven for roughly another 15 minutes. The cheese should be melted and look a little crisp. Take it out of the oven and roll immediately. Use the baking paper to help you lift and get the rolling started. Once rolled, you can serve it straight away. With the added potatoes, it just about served us 4. If you don't want to serve a side of something with it, you will probably need 3-4 of those pizzas to serve 4 people! Wow, I have never seen something like this before! It looks really interesting and does sound tasty. How good is cheese, for so many reasons?! Cheese (and cafe latte) the reason I could never go vegan, it simply is too good! I need this in my life. 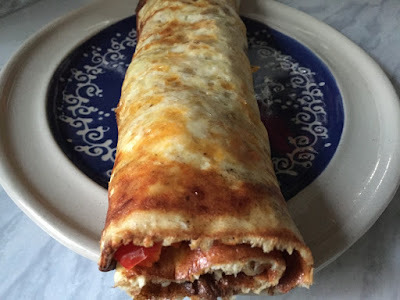 I'm so missing low carb, gluten free foods & this recipe is going to be taken out for a trial run for sure (just as soon as I get a kitchen to cook it in). it is definitely worth a try! I made this for my mum this week, she is a coeliac and needs to eat gluten free! She said it´s heavenly and took notes for the recipe to try herself! You need a kitchen! Can cheetahs eat this pizza treat as well?